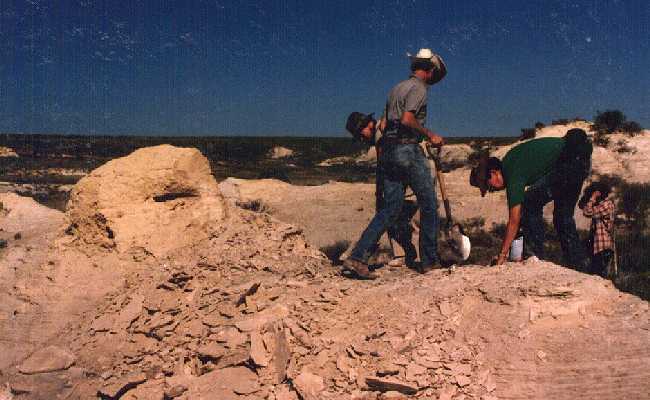 LEFT: Ground level shot of me on the dig of my second mosasaur... a partial Platecarpus skull from near Castle Rock in Gove County, Kansas. Please note that this is one of my original webpages and the photographs (film, not digital) are a bit small and dark... hopefully I'll get around to updating it someday! 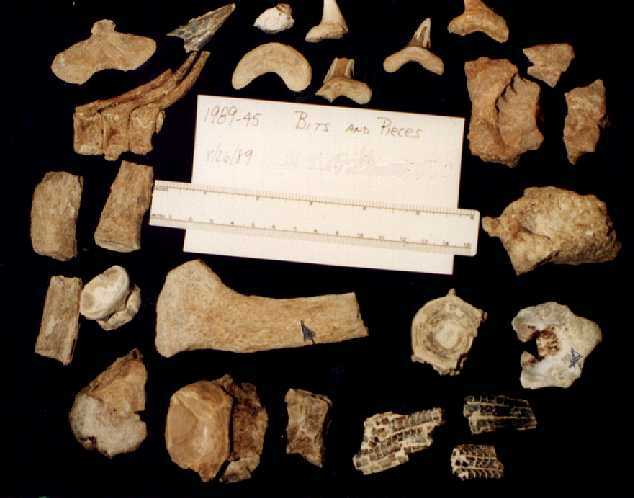 I've been interested in rocks and fossils for as long as I can remember, and collected Pleistocene-age bones and teeth from riverbanks and sandpits while growing up south of Wichita, Kansas. In college, I majored in zoology and didn't have a chance to take even a geology course until my Senior year. I enrolled in Dr. Paul Tasch's Vertebrate Paleontology class with some misgivings... after all, the other 9 guys in the class were geology majors and knew a lot more about fossils than I did.... didn't they? As it turned out, vertebrate paleontology was more about biology than anything else, and the geology types ended up asking me more questions than I asked them. 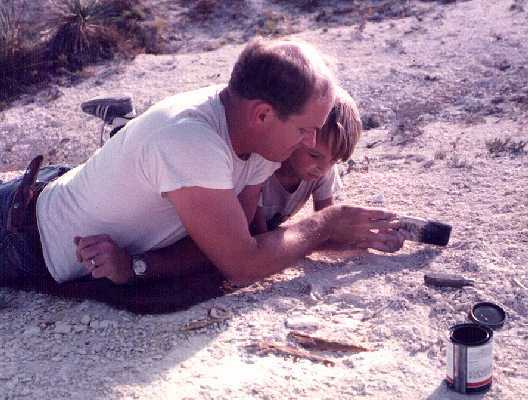 We had one memorable field trip to the Smoky Hill Chalk, and even though all I found was a small fish (Enchodus), and a sharks tooth, I was hooked. As far as I know, only one of my classmates in that Vertebrate Paleontology class actually ended up in paleontology (the rest probably got rich in the oil business). One of my friends, who was also a football player at WSU, named Mike Greenwald went on to get his Masters in paleontology while I spent two years in the Army and came back for a Masters in Environmental Biology. 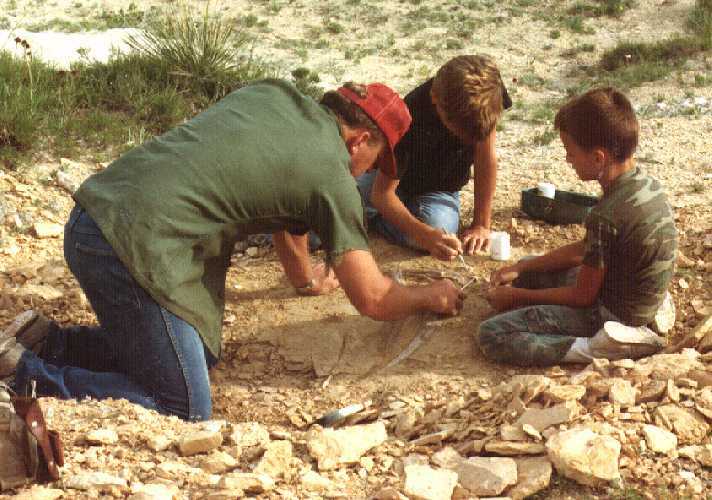 Starting my career and family seemed to take a lot of time and paleontology became a once or twice a year, one-day visit to the Smoky Hill chalk. I managed to find enough new things to keep myself interested and learning. 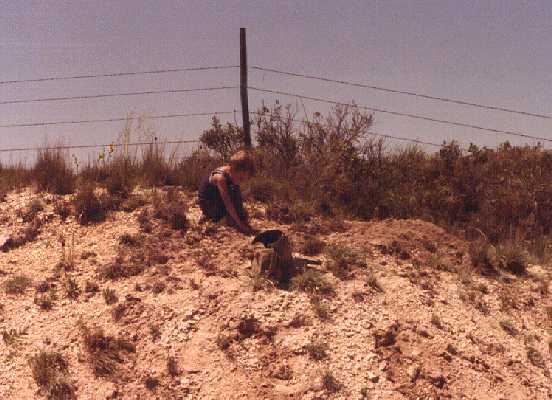 All that changed in 1979 when I found my first mosasaur and discovered that I REALLY liked paleontology. 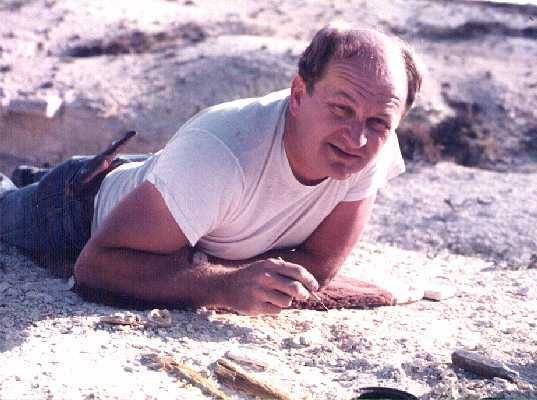 A view of my first major fossil find (circa 1968) from the Smoky Hill chalk in Ellis County, Kansas. I found this large and fairly complete Cimolichthys nepaholica fish coming tail-first out of the side of a roadside ditch. 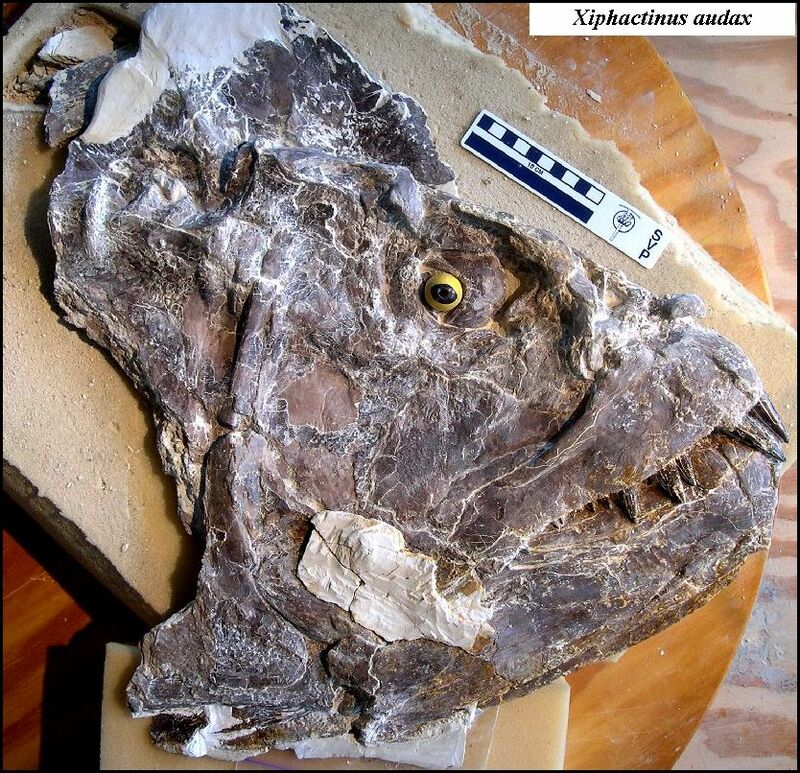 Problem was, I didn't know what it was at the time, and ended up donating it to the Geology Department at Wichita State University as a "90 million year old fish". Thankfully, as it turned out, Cimolichthys are very common in the chalk. "You don't know what you've got 'til it's gone." One of my early finds was a 'pile' of shark vertebrae. I knew just enough about shark fossils to recognize their vertebrae, and not much else. There were a lot of other 'things' preserved with this specimen and I had no idea what to make of them. Years later, long after I had donated this specimen, I discovered that in addition to twenty or so large vertebrae, I had found a nearly complete fin of a shark called Cretoxyrhina mantelli. Since sharks have no bones, the preservation of this material (calcified cartilage) is a relatively rare event.....so rare, I guess, that it took me more than 30 years to find another specimen like this. 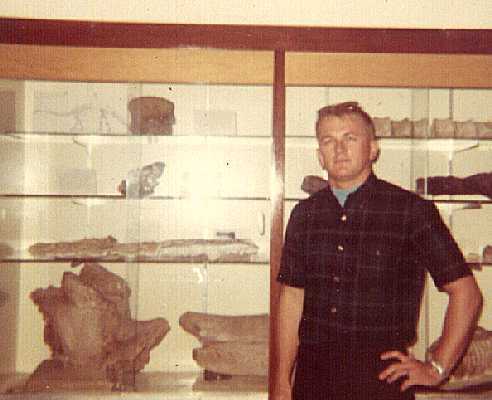 Me, with my "high and tight" military haircut in early 1969, standing in front of my first 'fossil fish' in the WSU Geology Department display case. At the time, the Vietnam War was in full swing, and I was getting ready to go into the Army. Understandably, at least to me, paleontology had a relatively low priority in my life. I had decided that I really didn't want to lug a bunch of fossils around the country, so I donated most of my collection to the University.... Now, I wish I had all of them back. During this period (and ever since) the paleontology collection at the Sternberg Museum at Fort Hays State University fascinated me. The Sternberg was a classic, dark wood and glass, museum that housed many uniquely Kansas fossils. Every time I went to the museum, I saw something that I hadn't noticed before. There were literally "fossils everywhere." Even though the collection was more or less evenly divided between "Ice Age" mammals and Cretaceous marine material, I was always drawn to the mosasaurs, fish and pterosaurs of the Western Interior Sea. 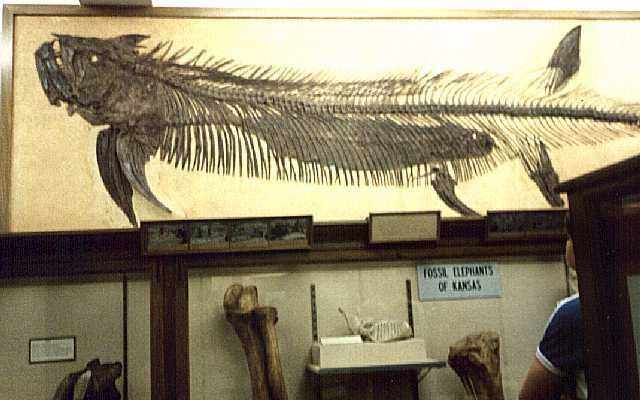 This photo shows the famous "fish-within-a-fish" Xiphactinus specimen collected by Sternberg in 1952 above a case labeled "Fossil elephants of Kansas"..... a little something for everybody. 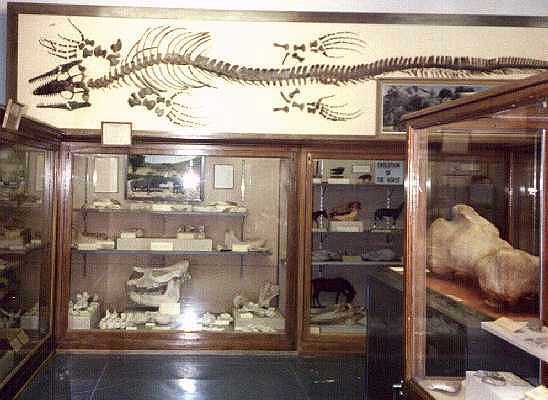 In this view, a "Sternberg Mount" of a Platecarpus mosasaur looms over wood and glass cases filled with mammal skulls and bones. 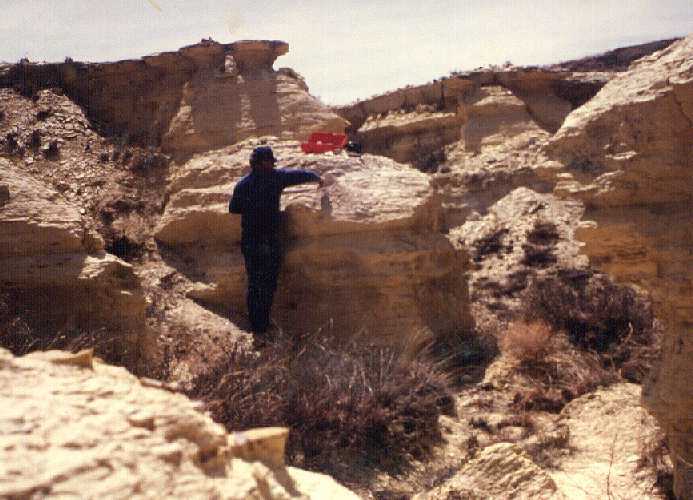 Western Kansas also has some unique sites for collecting large mammals from the Miocene and Pleistocene periods. Take a Virtual Tour of the new Sternberg Museum to see more late Cretaceous fossils. 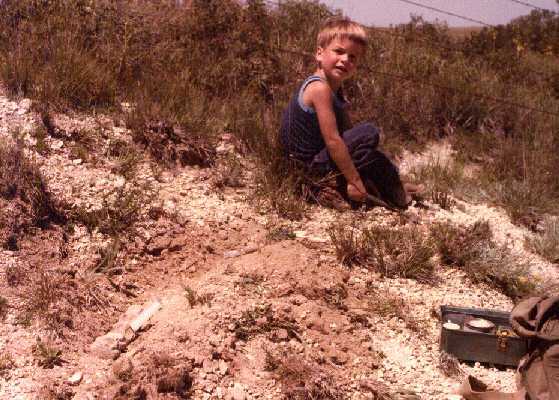 A decade or so later in August of 1979, when my son Matt was old enough (4) to accompany me into the field, we left his mother and little brother, Ryan, visiting friends in Hays while we went out to 'hunt dinosaurs' at my favorite site in Ellis County. This picture shows the area from the top of the hill. The car is the little white speck under the arrow at the right, and the place where we found our first mosasaur is under the arrow, left of center. 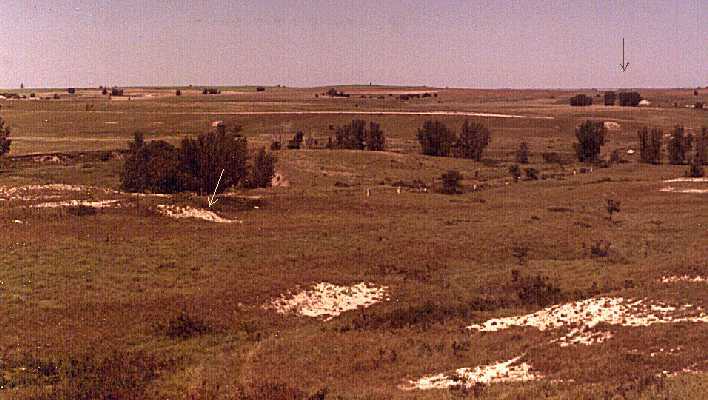 Unlike what would become our preferred hunting grounds further to the west in Gove and Logan counties, the Smoky Hill chalk in Ellis County is not exposed over large areas. More rainfall for the grasses, I suppose. As we walked along the fence, and up the hill, I noticed a large, reddish brown vertebra at the base of a small rise. It happened to be the only exposed chalk along the edge of this pasture and I had never paid any attention to it before. 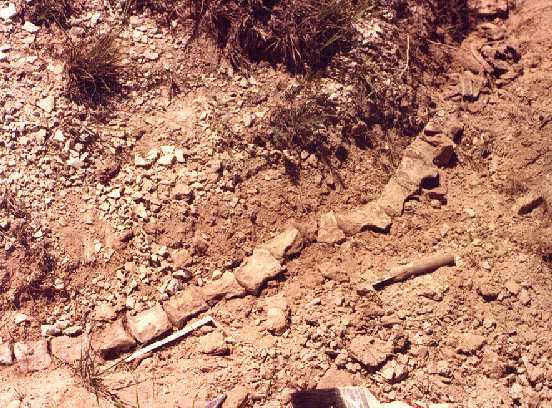 I had never seen mosasaur bones in the field, but I was certain that was what I had found. I looked up the slope and found another lying on the surface of the chalk. Then I found where a third was still partially embedded in the loose chalk. Even if that was all I found, it was 1000% more than what I had ever found before, and I was excited. I put down my pack and started to carefully remove the loose overburden, following the string of articulated vertebrae around the contour of the little rise. This was a good news-bad news situation that I wouldn't come to fully understand until years later. The good news was that the specimen was close to the surface and easy to dig because weathering had shattered the once-solid chalk into a mixture of dirt and small pebbles. 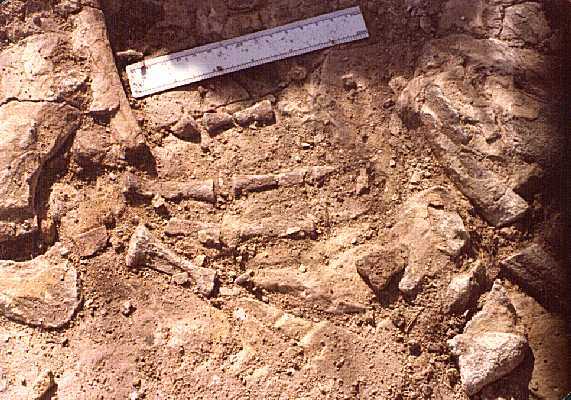 The bad news was that the same weathering had already began to damage the bones. Here Matt takes a good look and tries to figure out what his Dad is all excited about. To him, I suppose they looked like just some more rocks. To me, it was the find of my life. In this picture, I have exposed eight feet of articulated vertebrae. The funny part (at least to me) was that at the time I had no idea whether or not I was digging toward the head or the tail. Looking at my watch, however, I knew it was time to start the long drive back home. I numbered and picked up all the exposed vertebrae, then covered the excavation so that it wouldn't be readily noticeable. I still had no idea of what was left in the ground and it would be several months before I could get back to the dig. In November, 1979, just ahead of a cold front and approaching winter storm, I went back to the site. By then, I had looked at pictures of every mosasaur skeleton I could find and had realized that I was digging toward the head. There were no guarantees, of course, but the possibility of finding a mosasaur skull was pretty exciting. As it turned out, the mosasaur's skull was there, lying upside down, badly broken, but still articulated with the cervical (neck) vertebrae. 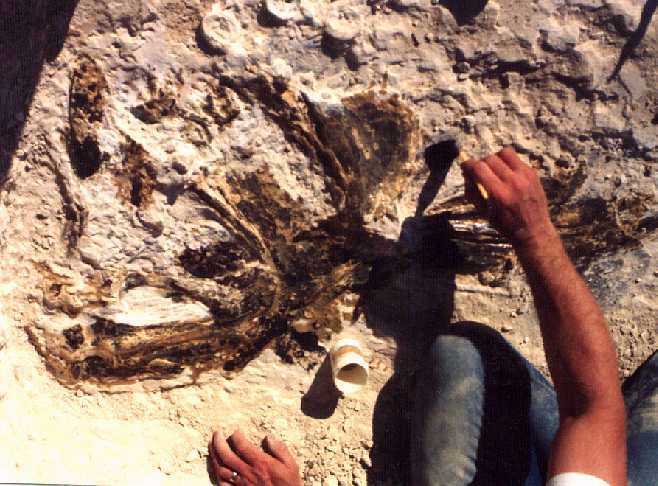 This picture shows the skull as initially uncovered, with the right lower jaw at the top (in the shadow) the premaxillary to the right and the braincase to the left. The right, upper and lower jaws are sort of 'co-mingled' in the foreground. The bones of a front paddle (left?) show up at the lower left. A closer, but not much better view of the mosasaur skull. At the time, the weather was getting worse, with lots of heavy gray clouds, and the camera and I were both getting cold. 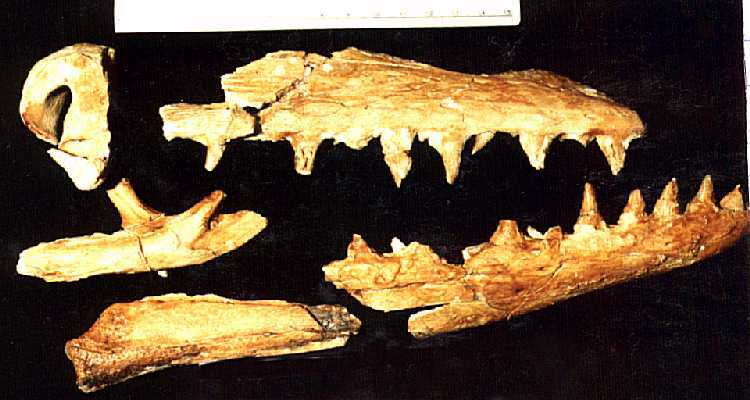 The lower jaws, with their characteristic 'hinge in the middle' are visible in the center of the picture, coming together on the right edge. 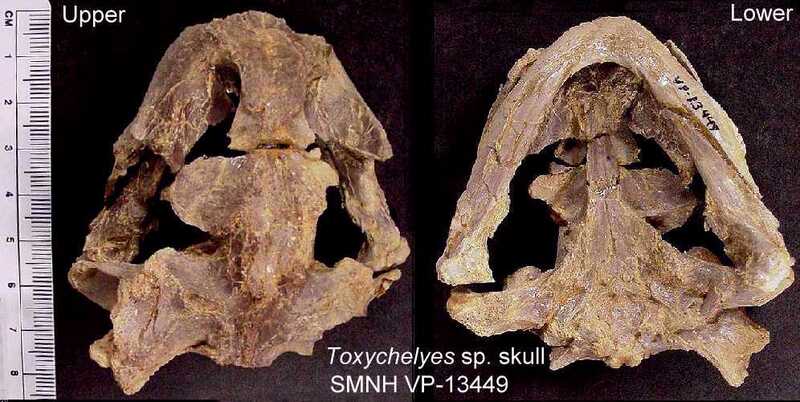 Unfortunately, as is the case with most Tylosaur skulls, most of the teeth had already been damaged beyond recovery. 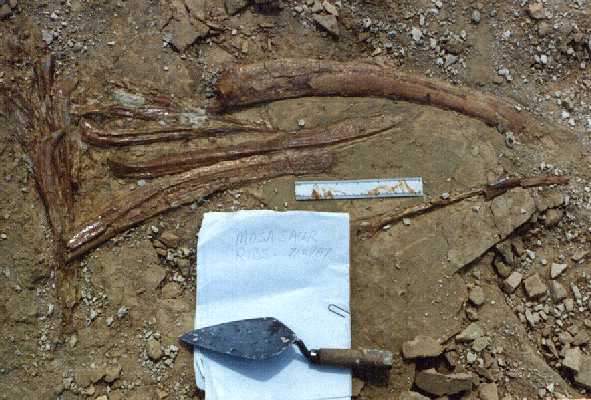 This picture shows a portion of the left front paddle in the center, shoulder bones on the left, and the broken left quadrate (lower right), Most of the front limbs were still in place, indicating that the carcass was not greatly disturbed after reaching the sea bottom. 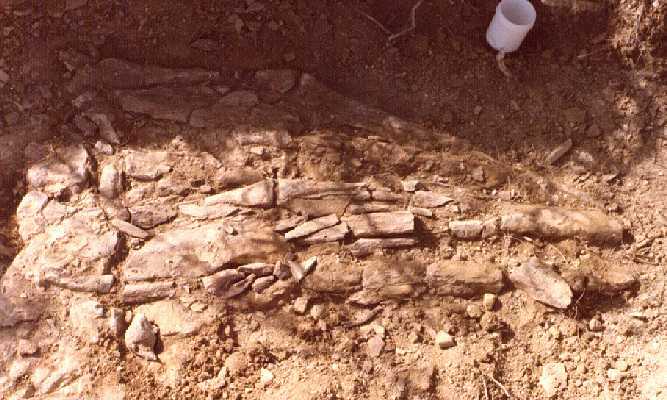 There were also several complete ribs, and probably some other remains that I overlooked or lost along the way. Interestingly, the only well preserved tooth found with this specimen was lodged between two cervical vertebrae (?!?). 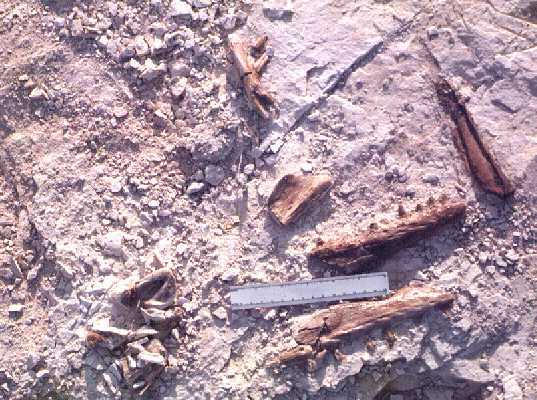 A closer view of elements of the left paddle, including the humerus and either the radius or the ulna at left, and the finger bones at center. Even though mosasaurs were totally marine at this point in their evolution, they still retained many characteristics of their land dwelling ancestors, and their paddles never quite reached the level of specialization found in ichthyosaurs and plesiosaurs. 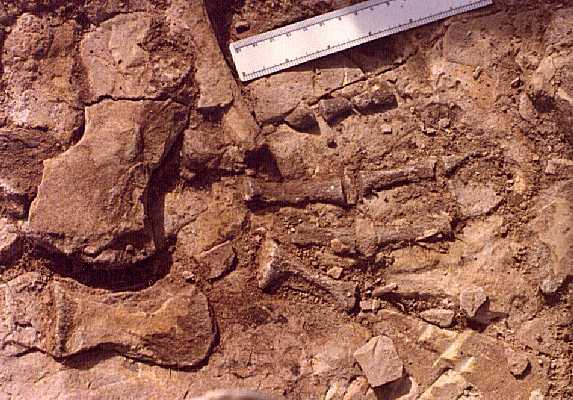 A top view of the partially prepared skull several years later. We were able to identify it as an undescribed species of Tylosaurus at this point. Unfortunately, the specimen was dropped years later during a move to a new home, and came out much worse for wear. It was part of the learning experience, I suppose, but one which I wish I hadn't experienced. In 1984, I took both sons and a friend on a camping trip (in the chalk, of course). As luck would have it, we set up camp about 50 feet away from the remains of a mosasaur that was eroding out on the surface of the chalk. This photo shows elements of the right side of a small Platecarpus skull as we found them. Here my youngest son, Ryan (age 6) learns the finer points of digging in the chalk from his Dad. As luck would have it, he was with me when I found this mosasaur. Now he and his brother were 'even'. At the time, his older brother, Matt, was out climbing the rocks with a friend and was not terribly interested in any kind of fossils. A little better view of the remains. The right maxillary is in the lower right side of the picture, with the right dentary sitting above it. One of the pterygoids is at the top of the frame and a quadrate is laying just to the left of the ruler (scale = six inches). Most of the rest of the skull, outside of a few pieces of the lower jaw and various other scraps had already eroded out and gone 'down the hill'. 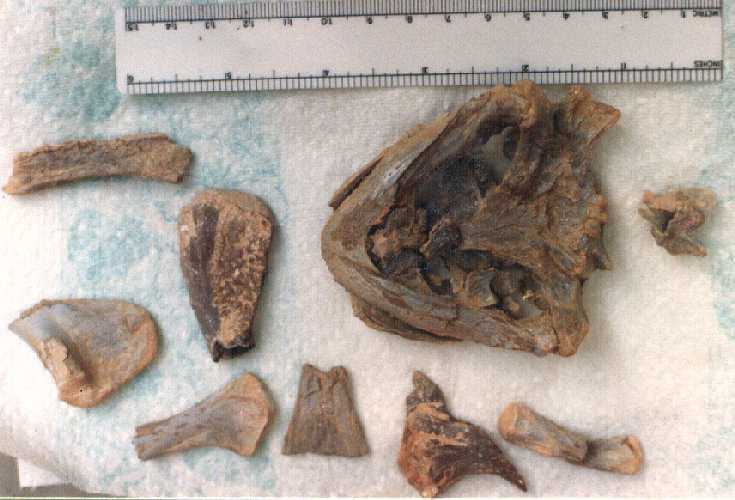 This is a medial view of the right quadrate of the mosasaur which, in reptiles, supports the tympanic membrane of the ear, and serves as the point of attachment for the lower jaws. In mosasaurs, it is also a very good diagnostic character between species. It took me years to find out that, based on this one bone, these remains came from a Platecarpus ictericus. 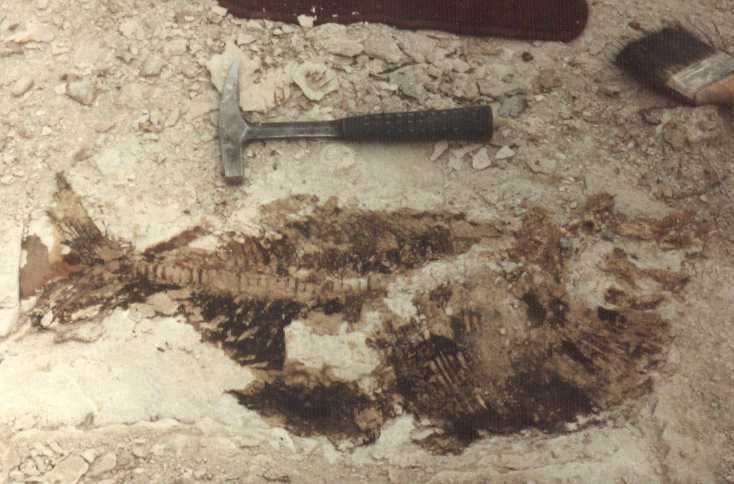 The major elements of the skull after removal. Not a great specimen by any reasonable measurement, but when it is only the second mosasaur that you've ever found, it is still a pretty big deal! In case you hadn't guessed it (here I am really dating myself), the bones are preserved with good olla' shellac. Hence that wonderful, warm brown color......much more character than BUTTER. 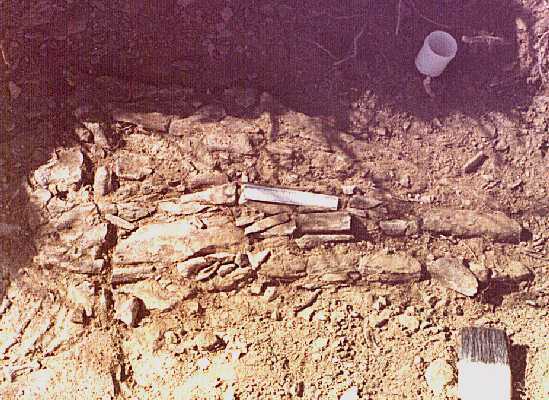 In 1987 we found a pile of long, narrow bones near Castle Rock. As Matt, Ryan and I worked on them, it appeared that they were rib bones. We guessed (incorrectly) that they were from a mosasaur and got pretty excited about it. A closer look showed that they were actually the fin rays from the pectoral fin of a large Cretaceous fish called Xiphactinus audax. Disappointing, but neat stuff, too. On a field trip to Monument Rocks in 1988, Pam found the vertebrae of a large fish coming out from under a mound of chalk. When we found more bones on the other side of the mound (about 10 feet away), we decided that it was too big a dig for us to do alone. We contacted a friend, David Parris of the New Jersey State Museum and asked if he would be interested in digging up the remains. He said, "Yes!" and we met him and his crew on the site in August when the temperature was over 100 degrees. We were taking a look at the locality where I had found my first mosasaur in 1978 when Pam found the tip of the skull of a swordfish like fish. The fish was later identified as Protosphyraena nitida. This was the first time that a complete skull of this fish had been found with the distinctive pectoral fins. Here Pam and I are sitting beside the skull. 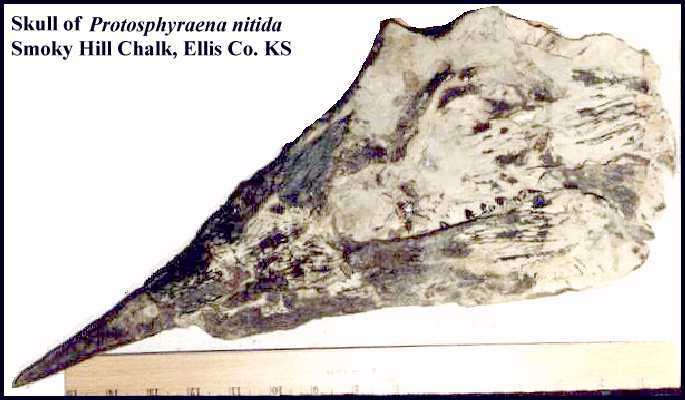 A close-up view of the skull of Protosphyraena nitida. 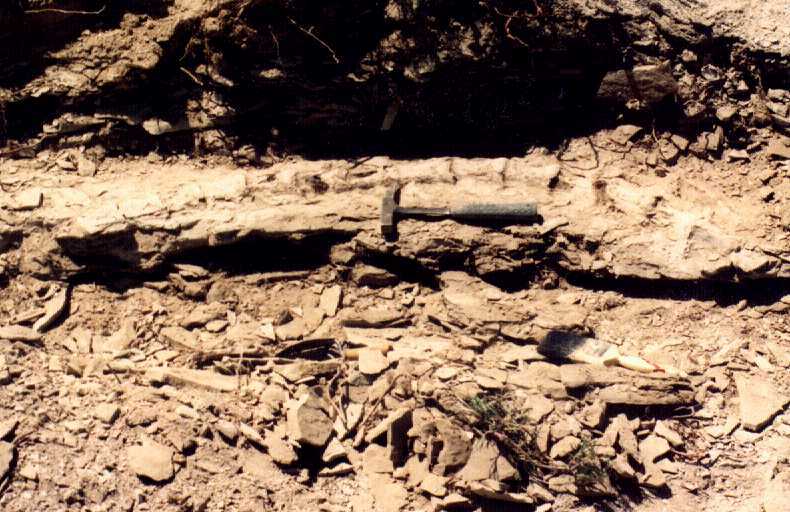 The rock hammer beside the skull is 13 inches long. A picture of the partially prepared skull is here. 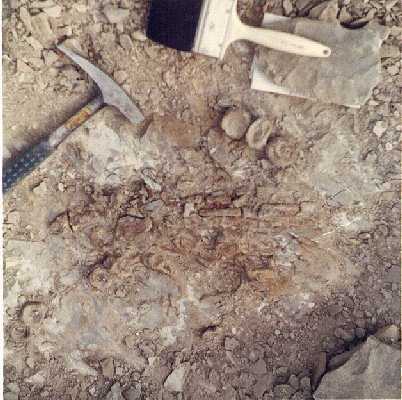 The skull was donated to the Los Angeles County Museum of Natural History and is shown here. Here Pam works on clearing chalk off the fossil while daughter, Katie, watches. A rare picture of me at work in 1989 (not that I don't work, but I'm usually the one taking the pictures). 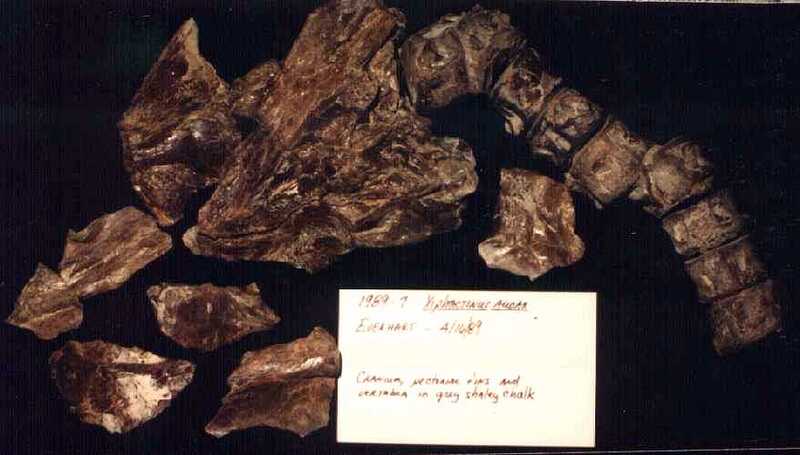 This specimen was a large Enchodus skull that Pam had discovered in a canyon south of Castle Rock. Not a pretty specimen, but certainly a huge skull of the fish (Enchodus petrosus) that we refer to as the "Saber-Toothed Salmon." It is distantly related to modern salmon, and the name is certainly descriptive. Note the extremely long fangs at the front of the jaw. This specimen was donated to the Cincinnati Museum Center in 1999. Here's another of Pam's interesting discoveries .... a complete fish - Bananogmius sp. 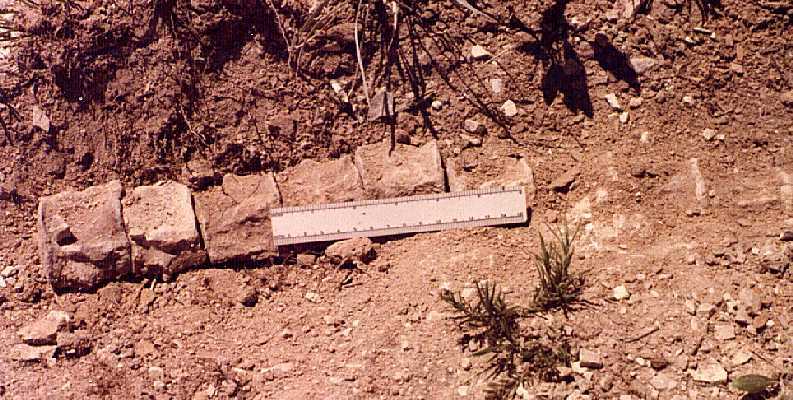 The rock hammer is 13 inches long. This specimen went to the Los Angeles County Museum of Natural History. 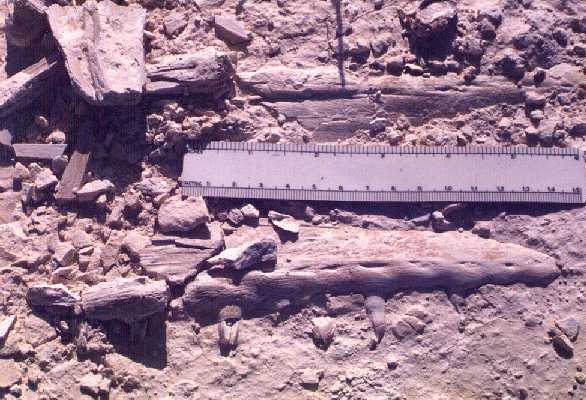 This is a series of 13 large and articulated mosasaur vertebrae (probably Tylosaurus nepaeolicus) found in the edge of a gully in the lower 1/4 of the Smoky Hill Chalk (Late Coniacian time). When this string of vertebrae was scaled up to the size of the animal that it came from, we found that the mosasaur was very large, about 10 meters long. This is much larger than mosasaurs were supposed to be during this time period. We are still looking for more evidence of these larger creatures. The remains of a skull and some vertebrae of a Xiphactinus audax that I found. Later that same year, Pam found an even better and more complete Xiphactinus. In this case, we excavated the front half of the fish (about 8 feet of it) and found that the skull was complete and in very good shape. The circular shapes at the top of the picture are some of the fish's vertebrae. 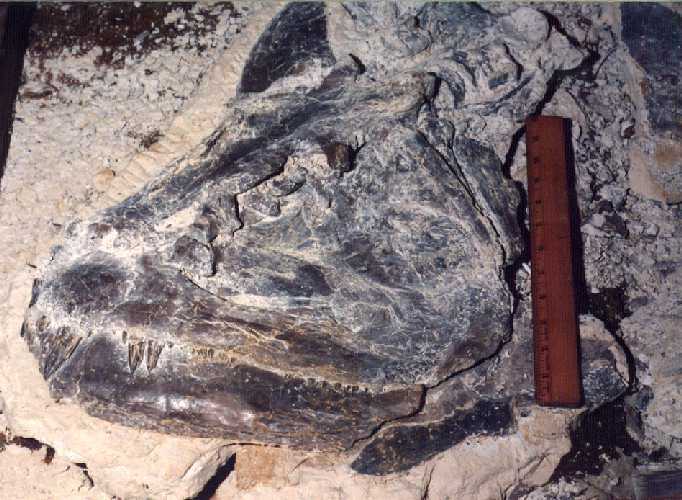 A picture of the skull of our excellent example of Xiphactinus audax. (Updated photo here) If alive today, this fish would give a new meaning to the term "sport fishing" since some larger individuals (18+ feet) were large enough to swallow the fisherman. I found a very large one (17') in 1996. An short note at this point to indicate that not everything we find in the chalk is large, complete or spectacular. This picture shows the kind of things that we find most often: sharks teeth, fish vertebrae, and the odds and ends of marine reptile bones...... the normal debris of a flourishing ecosystem in the Western Interior Sea. That brings me up to the end of 1989.....Stay tuned. There's more to come.